The runner writer on WellthyFit this week is Kartik Sarin – 31, born and raised in Chandigarh, a graphic designer specializing in developing brand identity and strategy. He is also the executive team member of Daudta Punjab, an organization that has been promoting and organizing several running events across Chandigarh and Punjab. He started running six years ago in 2012 and has been a regular since 2014. He says – “I’ve ran seven half-marathons and five 10K runs but the ‘real’ running happens every morning. Work does interfere but it’s not really a deterrent. I simply resume my daily zen where I had left it”. 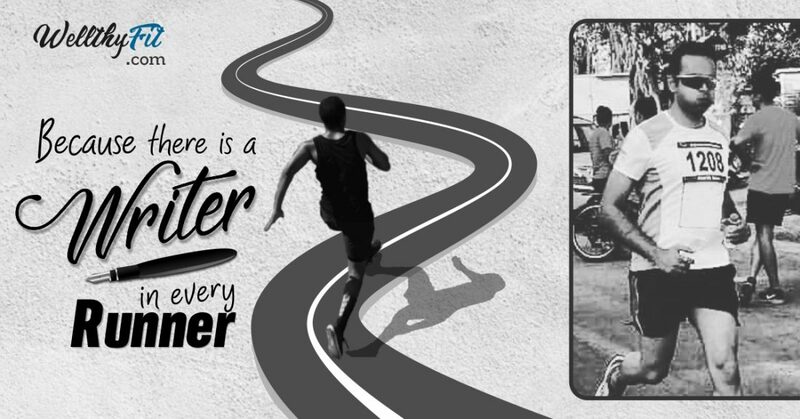 As I read through Kartik’s thoughts, it became clear once again – how running provides a writer an escape…or is it the other way round? You know monsters. You’ve known them all your life. You’ve known them since you were three. You’re coming home from the kindergarten holding on to your mum while she struggled with the umbrella. It was raining. Sideways. A wasted effort. A truck splashed us and undid that effort. And then it came. The lightning. The thunder. You remember it all too well. You remember how it froze you. You remember how every time it rained you would not go out while the other kids enjoyed. It was the monster. You learned too young about cruelty and pity. You learned too young that you are weak. That your neighbours, your cousins, your classmates and your only friend, are all better than you. More stronger than you. More wise. More compliant. You are six. You fight over a ball. You get roughed up. You have a broken finger. You take another knuckle on your head by a guy twice your age. Twice your weight. Ten times the adrenaline. You get up and walk home crying feeling miserable. Feeling small. Weak. You look back and you see him standing there laughing. This monster had a face. You’re nine. You’ve seen Top Gun on a VHS tape for the first time. You want to be a fighter pilot. You rush to the stationary shop and buy a bunch of alphabet stickers. You stick them to your bike. It says ‘Maverick’. You’re twenty-three. You never became a fighter pilot. You had failed the medical. Your eyes are too weak. The monsters had planned better than you had planned your life. You’re now in the real world working a ‘real’ job. More pay. And a car. You drink beer now. You also smoke cigarettes. A pack a day. Or two packs, if it’s a bad day. Or night. You’ve just had a violent break-up. You’re driving back home that one summer night. It might have been the dog crossing the road. Or the monster. You steer the car away and ram it into a tree. You have a burst intestine, a shattered leg, a compressed lung. And darkness. You’ve now seen death. Your family cried. Your neighbours cried. Your friends cried. Your cousins cried. But you survived. The monsters had played the final ace up their sleeve. It was your turn. You could hear the universe. Three surgeries, a colostomy and six months later, you get up. You didn’t walk. You ran. Hard. Till your bones broke again. The universe was watching. It was time to reclaim what you had lost. Running. That was your calling. It gave you the breathing space you needed. It cleared your head. It gave you a sense of accomplishment when you had lost all confidence. It didn’t matter much to anybody else. But for those forty odd minutes every morning, the Earth was yours. You meet a bunch of other warriors in shorts at the lake and they become your friends. Good friends. You run together. They push you to be better instead of pulling you down like the rest of the world. Runners. They are a strange breed. They love pain. They are up when the world sleeps. They inspired you. Every one of them. Running has since been your raison d’être. Its a strange guiding force, one that puts you in your place. The injuries that accompany you on your journey as a runner help keep your ego in check. You love running not only for the endorphins but also for its spiritual component. It heals you from the inside out. It fills you up with so much gratitude and humbleness. Running opened doors for you which didn’t exist before. But you want people—especially people who are going through what you went through—to know that things can get better, that if things got a little better for you, they will get a little better for them. You stay at the finish line for them and you cheer them on. Their wins become yours. You are part of the tribe. You’re thirty one now. You’ve quit jobs. Relationships. People. You have battle scars. Some still bleed. Your Katana is now sharper than ever, forged in the heat of your greatest battles. And the monsters are still alive. But you understand them better. You don’t fear them anymore. You no longer hide. You don’t run away from them anymore. They’re a constant in your life.They’ve made you better. You embrace them. You take them along on all your runs. Like you will tomorrow at 5:00 am. There will be coffee. And the war will continue.